Is Erdogan’s Mosul Escapade Blackmail For Another Qatar-Turkey Pipeline? The Turkish move to annex Mosul is further developing into a serious conflict. Iraq has demanded that Turkey removes its soldiers and heavy weapons from the “training base” near Mosul within 48 hours. It asserts that these were put there without asking or informing the sovereign Iraqi government. The U.S. was informed but Iraq was not? That makes it look as if the U.S. is behind this. Brett McGurk has also said that this is not a “U.S.-led coalition” operation but is otherwise playing “neutral” on the issue. Turkey said on Monday it would not withdraw hundreds of soldiers who arrived last week at a base in northern Iraq, despite being ordered by Baghdad to pull them out within 48 hours.The sudden arrival of such a large and heavily armed Turkish contingent in a camp near the frontline in northern Iraq has added yet another controversial deployment to a war against Islamic State fighters that has drawn in most of the world’s major powers. Ankara says the troops are there as part of an international mission to train and equip Iraqi forces to fight against Islamic State. The Iraqi government says it never invited such a force, and will take its case to the United Nations if they are not pulled out. The camp occupied by the Turkish troops is being used by a force called Hashid Watani, or national mobilization, made up of mainly Sunni Arab former Iraqi police and volunteers from Mosul.It is seen as a counterweight to Shi’ite militias that have grown in clout elsewhere in Iraq with Iranian backing, and was formed by former Nineveh governor Atheel al-Nujaifi, who has close relations with Turkey. A small number of Turkish trainers were already there before the latest deployment. The former policemen who ran away when the Islamic State took over Mosul are not and will not be a serious fighting force against their Islamic State brethren in Mosul. They are just a fig leave for the Turkish occupation. There are rumors, not confirmed yet, that Turkey now uses the presence of its force to blackmail the Iraqi government. 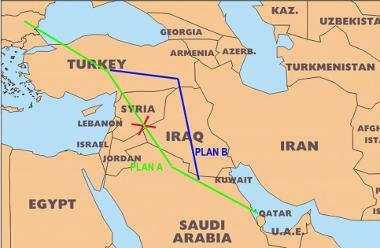 Turkey, it is said, wants agreement from Baghdad for a gas pipeline from Qatar through Iraq to Turkey. The original plan was to have such a pipeline run through Syrian desert flatland to Turkey and on to Europe. The gas from Qatar would be sold there in competition with gas from Russia. President Assad had rejected that pipeline and preferred one from Iran through Iraq to the Syrian coast. Qatar and Iran collectively own a huge gas field in the Persian Gulf. Whoever gets his pipeline going first will have a big advantage in extracting from the field and selling its gas. The rejection of the original pipeline project was one reason why Qatar engaged heavily in the regime change project in Syria. The Plan B would have the pipeline go through the rather rough east Anatolia – more expensive than the Syria route but feasible. The U.S. supports the Qatar project. Anything that would make Europeans dependent on gas from a U.S. controlled regime is preferable to Europeans who do independent business with Russia. Erdogan visited Qatar on December 1 for two days and the two countries signed a number of “strategic agreements”. The Turkish troops moved to Mosul on December 4 and 5. This makes the pipeline extortion that Turkey is said to try with Iraq at least plausible. But Iraq and its Prime Minister Abadi can not agree to the pipeline project. Its allies in Iran, Russia and Syria are all against the Qatar-Turkey-(U.S.) project and would see that as treason. Shia militia in Iraq, especially the Badr brigade, have threatened to destroy the Turkish force near Mosul. They would remove Abadi from his office if he would fold under the Turkish-Qatari-(U.S.) extortion scheme. Syria’s government said the U.S.-led military coalition has carried out a deadly airstrike on a Syrian army camp, but officials from the alliance said the report was false.Syria said four coalition jets killed three soldiers and wounded 13 in the eastern Deir al-Zor province on Sunday evening, calling it an act of aggression, the first time it has made such an accusation. The Syrian Observatory for Human Rights reported earlier that jets likely to be from the coalition hit part of the Saeqa military camp near the town of Ayyash in Deir al-Zor province, killing four Syrian army personnel. But a U.S. military official, speaking on condition of anonymity, said the United States is certain that Russia was responsible for the deadly strike on the Syrian army camp . The official flatly dismissed claims that U.S.-led coalition jets were responsible. Damascus insists that four jets entered Syria from Al-Bukamal, Iraq and fired 9 missiles against al-Saeqa military base in Ayyash near Deir Ezzour. The U.S. accuses Russia to have committed the strike. I very much doubt that. There have been accidental “friendly fire” strikes by the Russian air force against Syrian troops and against Hizbullah. But those accidents were always immediately admitted and investigated within the 4+1 alliance. The Russians say they did not do this strike and Damascus agrees. But notice the weasel word in the U.S. statements: “U.S.-led coalition”. The Turks in Mosul are not part of the “U.S.-led coalition” even if they first claimed to be. If the air strike in Syria today were not done by the “U.S.-led coalition” it could mean that some country committed these air strikes on its own without the strike being officially within the “U.S.-led coalition” framework. Could that country’s name start with a Q? The U.S. will know who really launched this strike. In both, the Turkish aggression on Iraq and the airstrike in Syria today and even with the earlier mountain ambush on the Russian jet, the U.S. is likely “leading from behind” the curtain. All these events are, like the now forming new alliance with Jihadis, part of Obama’s bigger plans and designs for Syria and the Middle East. Lead Graphic: Soldiers at Kirkuk-Ceyhan pipeline (Iraq) in 2012 Iraq Energy News. Posted in Carbon Fuels, FEATURED, GUEST AUTHOR, Iraq, Turkey and Tagged Erdogan, pipeline.